The Block Shop owners know a thing or two about mixing pattern-on-pattern. Nestled in a historic building in downtown Los Angeles, Block Shop’s studio is part office, part showroom, part cozy living room. Founders and sisters Hopie and Lily Stockman have a masterful eye for layering pattern, which appears on everything from the textile company’s dhurrie rugs to decorative pillows to table linens. The duo uses a traditional Indian hand-block print process, but still push the envelope when it comes to design. Their collection of framed prints transformed those textile designs into modernist pieces fit for a contemporary gallery wall. The works, which are woodblock-printed on handmade cotton rag paper, make a strong case for textile as art. Photography by MEGHAN MCNEER; Block Shop’s indigo napkins for Heath Ceramics next to a sketchbook of patterns. The Block Shop HQ is essentially their home base, a sunny space seamlessly split into different zones for working and hosting clients. In other words, the perfect inspiration for an open-plan apartment. Upon entering, we immediately took style cues from the sofas layered with the brand’s pillows in graphic prints. 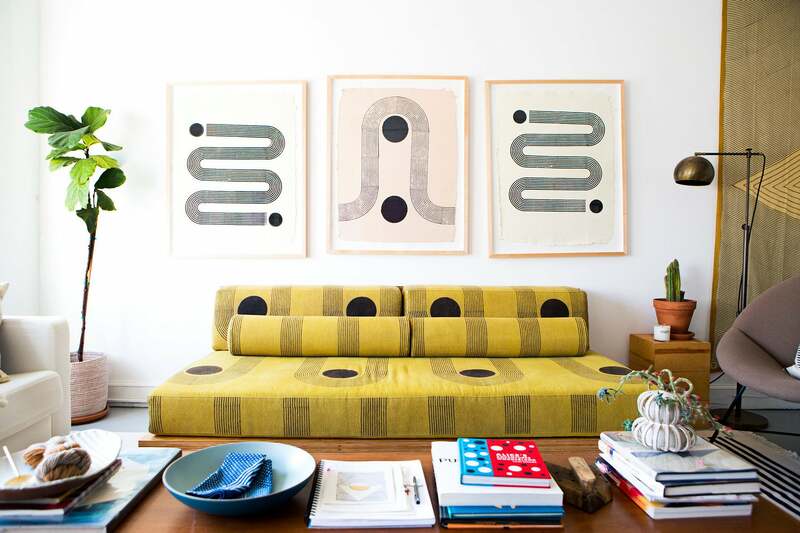 But our favorite piece has to be the George Nelson-inspired yellow block-print daybed. Designed in collaboration with LOC Architects, it’s the ideal spot for any sage-burning Cali-cool girl to kick back. If the studio’s mesmerizing mix of pattern and color is anything to go by, splash a few bold prints and bright hues around your space to create the ultimate feel-good vibes. Feeling inspired? Here are a few more Block Shop pieces we’re currently eyeing. Add a pop of color into your morning routine, with this lightweight, organic cotton robe. The brand describes this print as “an homage to the Art Deco architecture of Downtown Los Angeles”, which just so happens to be where Block Shop’s studio is located. This Indigo-printed runner is the perfect gift for any and all on your list. This story was originally published in November 2017, and has since been updated.